It’s another amazing creation from our friends across the pond, Hockleys Cakes and I absolutely love this cake. The first thing I adore about this cake are the tiers with their white icing and delicate black polka dots. They make the cake elegant and whimsical at the same time. And they’re perfect. But in my mind what makes this cake special are the ribbons around each tier and on top of the cake. The black and silver coloring are gorgeous and they “tie in” with the polka dots so well. And the ribbon on the top of the cake? Well, it completes the package, making the cake look like a most delicious wedding gift. 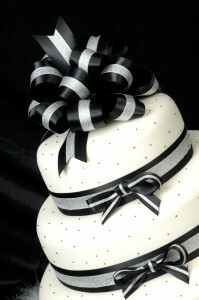 This beautiful ribbon-ed cake would be the perfect centerpiece at a small, intimate, elegant affair. Many thanks again to our friends at Hockleys for sharing another one of their beautiful creations with us!